Rumours have been around for years that Medalta is haunted. It can certainly feel like it when you’re here at night. On Saturday, October 29, we invite you to find out for yourselves. 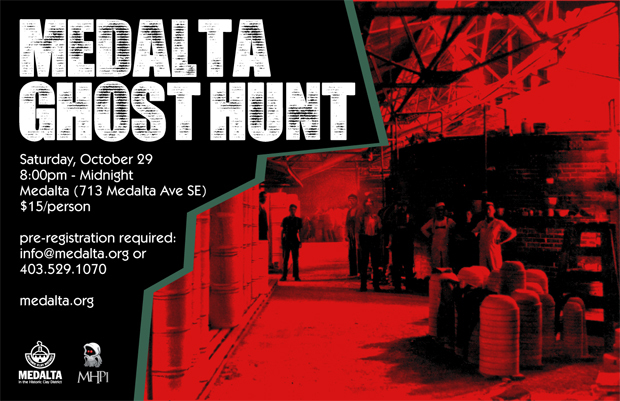 the Medicine Hat Paranormal Investigation team will be leading evening tours of Medalta, including the very-creepy old factory where little has changed since it closed in 1954. The cost is only $15/person to tour between 8:00pm & Midnight. There is limited space so if you want to register, call Quentin Randall at 403.529.1070 or email quentin@medalta.org. Payment can be made in advance or at the door. This entry was posted on Wednesday, August 24th, 2011 at 10:15 AM and is filed under Medalta Squared Gallery, Other Events. You can follow any responses to this entry through the RSS 2.0 feed. You can leave a response, or trackback from your own site.